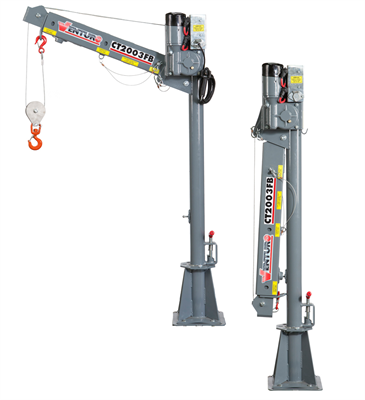 The Venturo CE1500FB is a 4,500 ft lb crane with a lifting capacity of 1,500 lbs with an electric winch, manual rotation, extension boom 3' to 5' which folds. For a printable specification sheet click on the picture above. The Venturo CT 2000 series (CT2003FB, CT2004FB, CT2005) features heavy-duty 1.8 hp electric winch, manual rotation, manual extension boom 3' to 9' that folds. For a printable specification sheet click on the picture above. 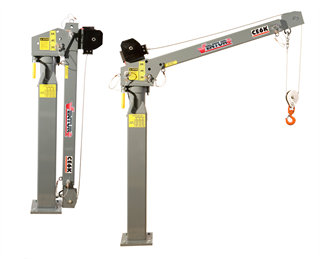 The Venturo CE6K is a 6,000 ft lb crane with a lifting capacity of 2,000 lbs. Features electric winch, manual rotation, manual extension 3' to 7' and manual elevation. 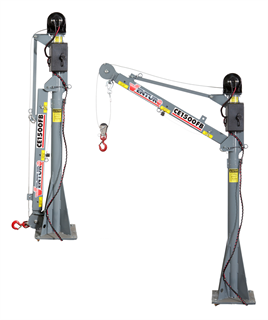 It is available with your choice of boom sizes, mast heights and winches to meet your lifting needs. The Venturo CT310KX is a 6,650 ft lb crane with a lifting capacity of 1,900 lbs. 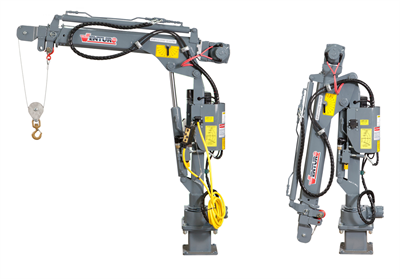 This electric mast crane is a four function electric crane which features a heavy duty planetary electric winch and a small footprint. Venturo currently offers a Continuous Rotation model and a Non-continuous Rotation model.